I've been competitively racing for almost 5 years, and I like to think I've had a little experience at the Junior level. I've qualified for 5 Junior National Championships where I've skied to an All American place 7 times, been competitive at the Minnesota State championships 5 times, and raced at Senior Nationals twice. 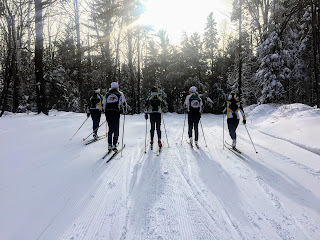 I felt very prepared for coming into college skiing, and although I wasn't at my best fitness or strength, I've trained at high levels before, so I felt like I could do it again.